Once the time fades away and wrinkle begins to grow on your forehead, opening the album to check the photos is a nice way to reminisce the sweet past. Hence then, have you ever managed to make your photos played like a video? I believe that not only do the scenes remain, but the most precious memory and joy. Actually, it is not a hard job to make video with photos. Many current media editing programs can finely complicate this task. I’d like to share some good-to-use programs and basic operations in the following parts. Hope they can make your photo videos in daily life more colorful. This application is designed for making and editing video with your local media files (photos, video and music) on webpage. This tool would come into serviceable, whenever you want to make a special video for the interesting and pretty photos taken in life, such as making birthday video, wedding video, trip video, etc. It provides different marvelous themes that can make your video more stylish and enchanting. Also, you can add desired music or sound track for your work. Check the instructions below to learn how to make video with photos. Choose a theme that you like and then click “Make a free video”. Click Plus icon on webpage to upload your photos. Click the option of “Add a Soundtrack” to merge preferred music. Press “Produce & Save” button to finish editing. Select needed resolution on pop-up page and then click “Make SD video” or “Make HD video”. When it completes the task, you can click the button on webpage to save the video to your local disk or share with others via Facebook, Twitter and Email or directly upload to YouTube and Vimeo. Although this method is quite easy and convenient to use, those people who prefer more editing options and special effects may complain about the limited functions. You also need to notice that the video created by this online application will be attached with a watermark which will be removed only after paying. Aside from the online application, there’re some other effective applications that can also create video with photos perfectly. You may learn more details from below. 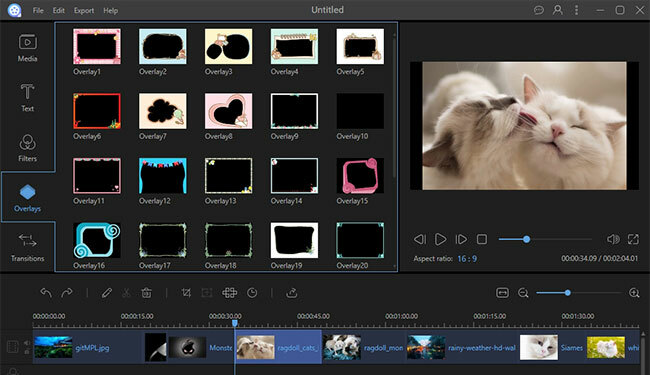 Windows Movie Maker is also a famous media editing application developed by Microsoft Inc. aiming to help Windows users to edit their media files like images, video and audio file. This tool comes with multiple filters, transitions and special styles for text, caption and title. Likewise, you can add your favorite or desired music and soundtrack into the project. In addition, you can customize the playback speed to emphasize certain important parts. Fortunately, this photo video maker is designed with a simple interface that enables users to operate without any hassles. 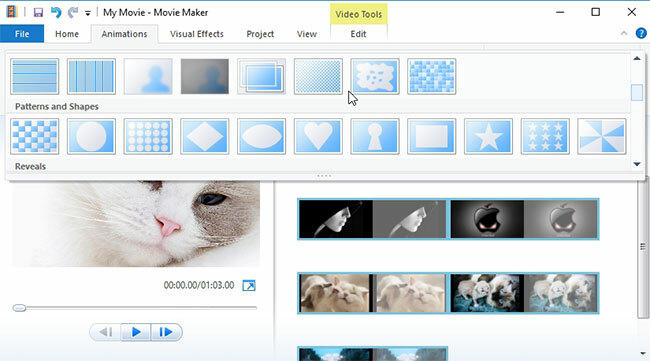 Download and install Windows Movie Maker from Microsoft official site. Open the application and then add your photos. Adjust preferred sequence for those pics. Add desired filters and transitions for the project. Add caption and title and music for your work. To make video with photos, you can also try ApowerEdit. This program is a professional media editing software that features comprehensive functionality in editing picture, video and audio file. Apart from traditional editing functions like trimming and cropping, it also provides various decent styles in text, transition, filter and overlay. With those unique effects, you can make the video more personalized and stylish. Also, the operation of this program is quite easy, you may refer to the steps below. 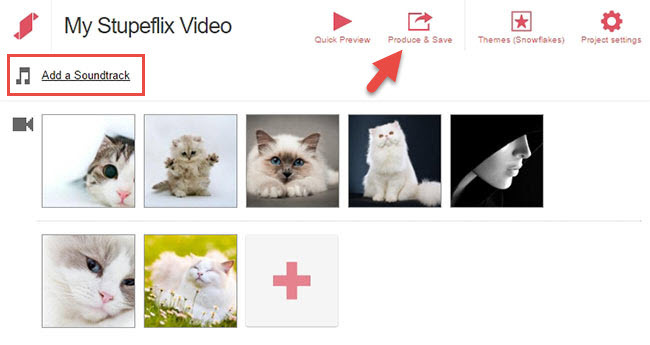 Click the button below to download and install the video editor on your computer. Launch the program and add your pictures. Press Ctrl + A button on keyboard to select all photos and then right click and choose “Add to Project”. Customize the project by adding transition, overlays and filters. All of those methods suggested above are quite efficient to create video with photos. The web-based application is simple and convenient. But it falls short in supporting more practical functions. If you prefer more advanced features, it’s recommended to use ApowerEdit. Rating: 4.8 / 5 (based on 49 ratings) Thanks for your rating!